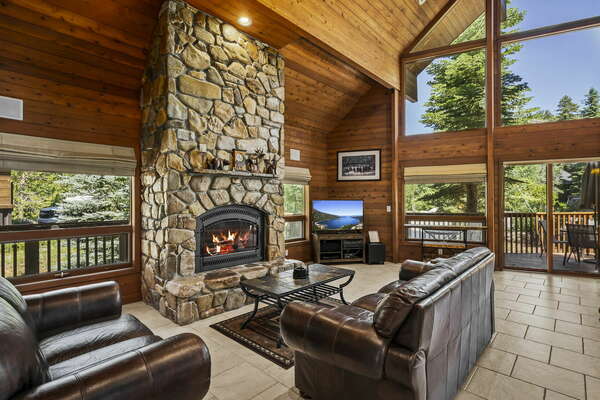 A luxurious lakefront home awaits you, imagine waking up to a breathtaking view of Lake Tahoe's dazzling water and Sierra Nevada snow capped mountains. This complex is located on the North Shore of Lake Tahoe and gives you 180 degrees views of the lake and surrounding mountains.The location is the best as you are right on the water in the summer and within only 10 min drive to Northstar, and if you don't like to drive in the winter, just take the shuttle that stops across the street. Our Sweetbriar L6 has been designed and decorated with Lake Tahoe in mind, beautiful furniture, art and décor will welcome you from the minute you step in. On the first floor you'll find an open concept kitchen/dining/ living room with floor to ceiling glass doors so you can enjoy the amazing view even when you're cooking, dining, watching TV or just relaxing. Sweetbriar Lakefront 6 features a beautiful gas fireplace in the living area and granite counter tops in the kitchen, just off of the living room you'll find a patio and a private deck that overlooks Lake Tahoe. Take a quick outdoors shower after laying on the beach. The second floor has 2 bedrooms, one full bath and the master suite. As you enter the master bedroom you'll be welcomed by the same floor to ceiling doors and windows to bring the outdoors in. Take a bath in the jetted tub and lose yourself in the spectacular view of the lake from the second floor. The outdoor patio is a place where you can have your BBQ's and dinner with family, sunbathe, read a book and just relax. Sweetbriar is a family oriented complex where everyone comes to enjoy, relax or be active and relish Lake Tahoe! The activities are endless here, you can rent a buoy and have fun on the water, rent a kayak or a paddleboard, play volleyball on the beach, play golf across the street or only 7 miles away go mountain biking, hiking, skiing or snowboarding at Northstar. You'll love the array of activities and the central location of this home.